Go to the Apple menu, click About this Mac and then the Storage tab. You’ll see, next to colour-coded sections for Documents, Apps, Photos, etc, there’s one called Purgeable. What is the purgeable space it refers to? Simply, it’s made of files that can be safely removed when you use macOS Sierra or High Sierra’s Optimize Storage feature. Purgeable data can be of any type. From cached movies in your iTunes to language files you’ve never used. The Optimize Storage feature allows you to quickly identify files that are taking up lots of space on your startup disk and either delete them or move them to iCloud, depending onto type of file. There are a couple of different ways to use it, one of which uses CleanMyMac and which adds an extra tab – ’System Junk’ – to the Manage Storage window. Here’s method one. If you have CleanMyMac installed on your Mac, you’ll have noticed an additional section – System Junk. These are system files CleanMyMac has identified that can be safely trashed. All you need to do is click on System Junk and click Run. 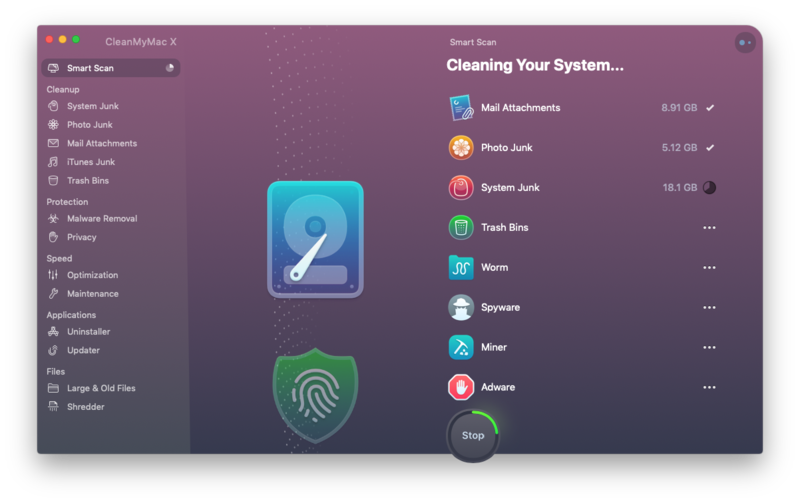 If you don’t have CleanMyMac installed, it’s available in Setapp – just launch Setapp, search for CleanMyMac and click Install. Launch CleanMyMac, click the Smart Scan tab and then click Scan. When CleanMyMac has finished scanning, click Run to perform cleaning. Also you can perform clean up with Cleanup section – System Junk, Photo Junk, Mail attachments, etc and review the results. You may be surprised by the results and by just how much space you can reclaim. To see in detail what CleanMyMac has found in each section, click Review Details. From there, you can uncheck any items you don’t want to delete. When you’re ready, click Clean to delete the junk. When you’re done, you should have got rid of several gigabytes of purgeable data and freed up lots of room on your hard disk. 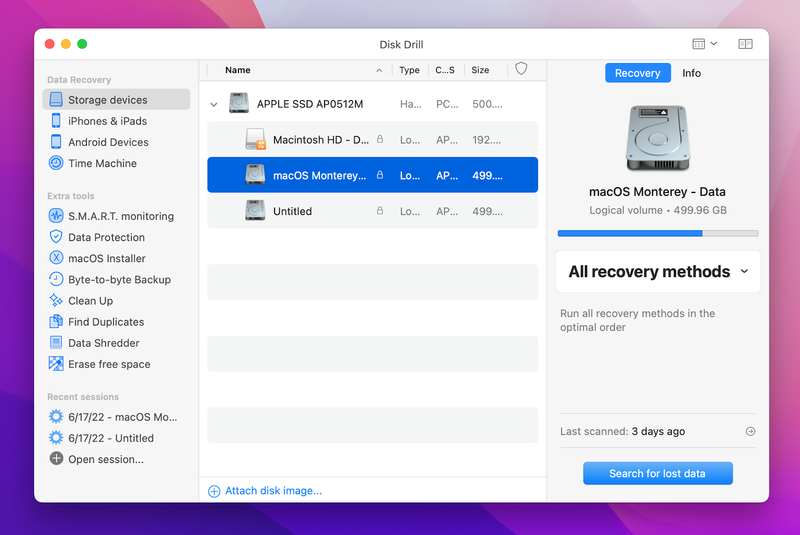 Disk Drill, also available in Setapp, has a Clean Up section, which allows you to identify and delete files you don’t need. Install Disk Drill from Setapp if you haven’t done so already. Launch it and click ‘Clean Up’ in the toolbar.’ In the next window, click ‘Let’s get started.’ Click on the drive you want to clean up, then click Scan. Starting at the top, click the drop down arrow to display files inside the folder. If there are more folders inside, click the drop down arrows on those. You’ll soon tunnel down to the files that are taking up the most space on your drive – they’ll be labelled in red. To change the way Disk Drill displays files, use the other menus. For example, you can display files by the percentage of the total disk space they use, or only display files that take up more than the space your specify. Another way to free up disk space is to get rid of duplicate files. Gemini, another app available in Setapp, does exactly that. Install Gemini from Setapp and launch it. Read the information cards that appear and click Next when you’re done. When you see the window with a big ‘+’ in it, drag a folder onto it to identify duplicates. For example, open a Finder window and drag your user folder onto the ‘+’. 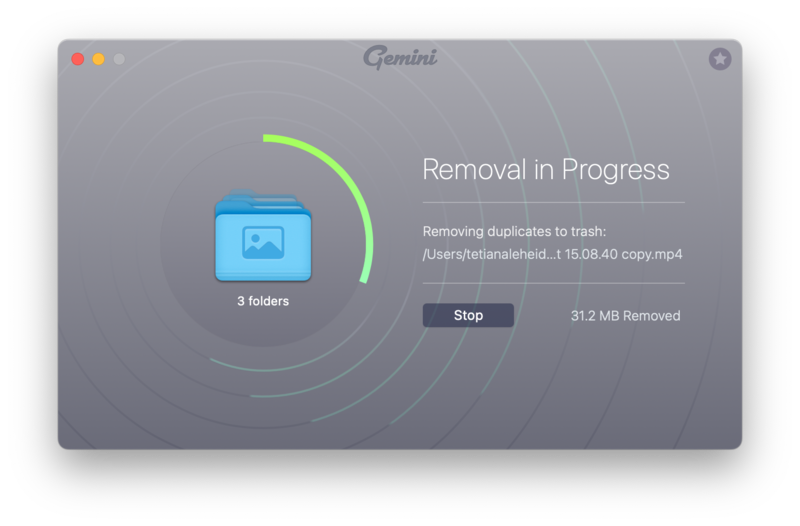 Gemini will start scanning the folder for duplicate files. When it reaches your iTunes and Photos libraries, it will ask you to open those applications. You can either do so, or skip them and Gemini will leave those libraries alone. When it’s finished, click Clean Up to remove all the duplicates it’s found, or click Review Duplicates to select the ones you want to remove yourself. In the review window, click on the drop down arrow next to folders of duplicates, make sure they really are duplicates, then check the box next to the one you want to delete and click Remove. Click on the Apple menu at the left of the Finder menu bar and choose About this Mac. Click the storage tab and you’ll see a bar with different colored sections on it. Each of these sections describes a specific type of data. Documents is first, followed by System, then Apps, and so on. Towards the right, you’ll see a section called Purgeable. Click Manage to free up space on your Mac. The next window that opens, launches with the first tab on the left, Recommended, selected. You’ll see four options. The first allows you to store all files on the Desktop or in your Documents folder in iCloud and only keep those you’ve opened recently on your Mac. To enable it, Click Store in iCloud. The next three options allow you to remove movies and TV programmes you’ve already watched in iTunes from your Mac; empty the Trash automatically every 30 days; and review files in your Documents folder and delete any you don’t need. Once you’ve been through the Recommended options, you can click on the other sections on the left and follow the instructions to either delete files or review them before deciding what to do. 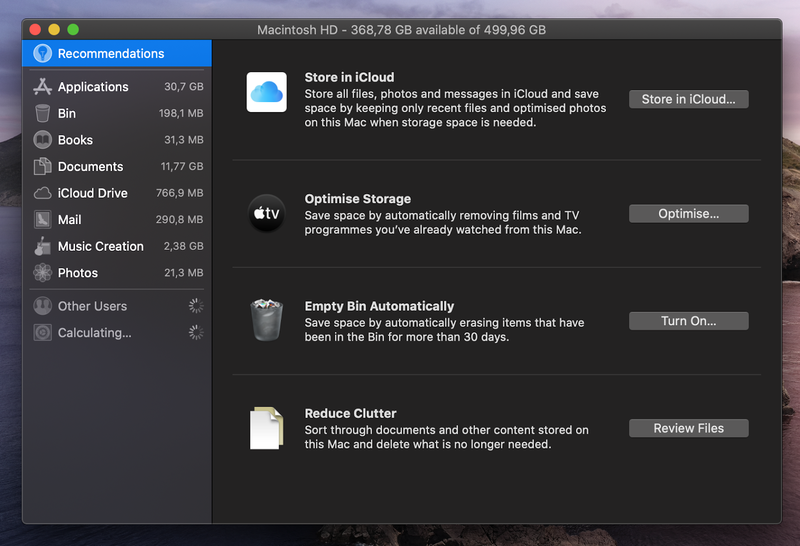 That’s about all you need to know about what is purgeable space on Mac and how to get rid of the problem of limited storage. And we hope this article has been of help.